Exactly one hundred and ninety nine years ago, Sir Stamford Raffles arrived onto the island of Singapore. Appointed the Governor General of Bencoolen just a few months before, he had recently convinced his superior in India to fund a new British base in the region. Singapore had a lot of things in her favour. There was an excellent harbour that could provide shelter for merchant ships and an abundance of fresh water and timber for ship repairs. Most importantly, the Dutch have yet to establish a presence in Singapore. Raffles wasted no time. Within a week of his arrival, he signed an agreement with the newly installed Sultan and appointed William Farquhar as the Governor. He also laid out the premises for Singapore’s survival – the port is to be unfunded lest it be seen as a burden by India and that no port duties were to be imposed. He set sail for Bencoolen the very next day and would not return until three years later. With his actions that week, Raffles created the very first version of Singapore Inc.
We were part of the British’s colonization plans. In the 1800s, colonisation was the de facto way to trade internationally and the British particularly excelled in it. The East India Company served as an outpost to extend the British influence and establish trading routes between Asia and the United Kingdom. Colonisation was perhaps the lesser evil of war, to subjugate foreign land and people without violence and the deaths of many. Historians would have us believe that Singapore Inc’s success lies in our superior geographical location. For a good part of the last two centuries, we were masters of the entrepot trade, with ships from all over the world calling at our harbour. We were the essential port of call between the East and the West. We were clean, safe and efficient. We began to prosper. This romanticized rags-to-riches Singapore story has been told and retold many times. If our young country can be likened to a kid, we would be the kid who has been told that he is the most brilliant and the best kid ever. Such a kid will grow up thinking he can do no wrong. The moment of truth will sink in as he matures, when he realizes that there are plenty of people better than him. I am very proud to be a Singaporean. As we celebrate our country’s 53rd birthday, as the flags fly high and the songs are sung with gusto, I urge everyone to put aside the idealism for a moment and look reality right in the face. As the chapter on colonisation closes, another form of world dominion began. After World War II, we witnessed the birth of two superpowers – the United States of America and the Soviet Union. Political ideologies were imposed on many member states and allies in order to consolidate their spheres of influence. Germany was split into two by a symbolic and physical Berlin Wall. The race to space and the rapid development of armaments served as showcases of cutting edge technology and economic strength. Many have agreed that they were meant more to intimidate rather than for the purpose of utility. The United States eventually emerged winner of the Cold War as the Soviet Union disintegrated in 1991. The United States, either knowingly or unknowingly, started to dominate the world with its numerous Multinational Companies (MNCs) in the 1960s. The MNCs exported the culture of consumerism, urging us to buy products and engage in services whether or not we really need them. American MNCs became her outposts, projecting her influence far and wide. Make no mistake. Although we had our successes, Singapore is not the United States. We are a small country. We are a price taker, both in trade and in diplomacy, subject to the mercies of global superpowers. In return, we exert little or zero influence on them. While it sounds obvious, there is a big implication for local stock investors and entrepreneurs alike that I would like to address in this article. There is a macroeconomic ceiling that we have to contend with. Do we have a truly global company? When we talk about great Singapore brands, our national carrier comes to mind naturally. However, despite all the awards they have won and all the superlatives heaped onto them, Singapore Airlines remains a very niche player. In the global scheme of things, few foreigners are aware of the airline we are so proud of. What about DBS, the largest company in Southeast Asia by market capitalisation? Again, it is the case of being a big fish in a small pond. While established in the region, DBS is far from being a global player in the banking leagues. The Americans have their Coca-Cola, Nike and Starbucks. These are globally recognised brands and few people in secular societies anywhere in the world would have problems resonating with them. What did the Americans do correctly to dominate capitalism? More pressingly, I want to understand why are we not living up to our romanticized Singapore story? If we are so successful, why do we not have a global company to show for? Association of South-East Asian Nations (ASEAN) is an alliance of ten countries within the region. All in, ASEAN boasts of a combined population of over 600 million. In 2016, the ASEAN GDP was $2.5 trillion. This was even higher than India’s GDP of $2.3 trillion. On more than one occasion, we were told to look beyond Singapore as a single market of 5 million people. Companies were encouraged to look towards ASEAN for their expansion plans and also to tap on their human resource requirements. Our ‘home market’ is actually more than one hundred times of what we think it is, or so the narrative goes. That is a cool story. The reality cannot be further away from the truth. ASEAN has always touted the idea of diversity. For businesses, diversity means customisation, and customisation translates to addition costs. Diversity, unfortunately, is more of a bane than a boon for businesses. Imagine you have a business model that has worked well in Singapore and you have captured the largest market share in the country. Geographical expansion is a natural progression. This will allow you to tap on a wider pool of customers to sell more of your product to. You are all ready to take the plunge. While the product has sold well in Singapore, you are naturally concerned about how the product will fare in other markets. In terms of languages, ASEAN speaks English, Tagalog, Indonesian, Khmer, Lao, Malay, Putonghua, Burmese, Tamil, Thai and Vietnamese. This means that the product name, descriptions, manuals will all have to be translated. There will be differences in culture and beliefs. On top of that, Indonesia is the largest Muslim country in the world, Philippines has an 80 per cent Catholic population, and Thailand is mainly made up of Buddhists. The diversity amongst ASEAN countries extends beyond race, language and religion. Economic status and purchasing powers vary greatly. Cambodia, Laos and Myanmar remain frontier markets. Barring Singapore and Brunei, which have achieved developed nation status, the rest of ASEAN countries are at the developing stage. The consumption patterns vary greatly amongst the countries. All these differences pose serious challenges for companies in the region to expand geographically within ASEAN. We will be hard pressed to name another country that is even remotely similar to us within our ASEAN neighbours. Can we really expand into ASEAN? The Straits Times Index (STI) consists of the largest and most traded public companies listed on the Singapore Exchange (SGX). These 30 companies represented about 79% of the total market capitalisation. Given that they are so entrenched in Singapore, they would be expected to form the first thrust for regional expansion. We could well expect these companies to have a larger business footprint beyond Singapore shores. 21 of these 30 companies were started in Singapore. The Singapore market is the biggest revenue contributor to these 21 Singapore companies at 29%. The ASEAN and China markets represented 21% and 26% of the revenue respectively. Note that some companies like Wilmar and SIA lumped their Asian revenue together and they could not be segregated into Singapore and ASEAN segments. Otherwise the actual figures would be even larger for Singapore and lower for ASEAN. Let us make sense of the numbers. Singapore is the smallest market and yet it is the largest revenue contributor. ASEAN is about 120 times larger in terms of population, and China is double that of ASEAN. Yet both markets contributed lesser revenue to Singapore companies. In a nutshell, our largest Singapore companies, most if not all mighty government- linked behemoths, were only able to capture a miniscule market share in ASEAN and China. We are far from making significant inroads. With just 5.5 million people, many Singapore companies would reach saturation point pretty fast. To grow further, they would either be forced to expand overseas or diversify into other product lines to sell in the same market. It is far from easy to export a business model into another environment that is different from that of Singapore. A tiny domestic market does not provide enough earnings to fund and buffer the business model experimentation abroad. There is a high chance that the expansion budget would be drained before a new workable business model could be developed abroad. Take QAF Ltd for example. Listed on the SGX, QAF owns and distributes the Gardenia brand of bread. It is a well-known brand in Singapore and they also have other businesses in Malaysia, the Philippines and Australia. The Company tried expanding into the Fujian Province in China, an ancestral hometown of the management, only to cease the entire operations in December 2017. They cited continuous losses as the reason. Bread is probably not a staple for the Chinese people. They may well prefer mantous, that in itself is an indication of different consumption (pun intended) behaviour in an overseas market. What works in Singapore may not work in another country. Very often in fact, it does not. The easier way out would be to create new product lines and sell to the same customers in the Singapore market. The risk of failing is lower as the existing businesses have established distribution channels but it also means that the growth potential is very limited. You could argue that the diverse markets in Asia and other parts of the world would disadvantage an American company as much as a Singaporean one. True. But the amount of resources availabe is vastly different. The U.S. has a 300 million population. The entire country is largely homogenous in terms of language, culture and political system. If a business succeeds in San Francisco, the founders could export that business model to another city with minimal tweaking. The replicability of business models to reach a large domestic and homogenous market is higher in the U.S. than anywhere in the world. This geopolitical advantage is unparalleled until recently. Hence, an American company would have been of a sizeable mass before it needs to expand beyond its shores. With a large domestic market providing financial support, they can afford more time to tweak their business models and products to make them work in different environments. They will also have the financial muscle to acquire proven companies in the target countries they want to venture into. Either way they will make greater and more lasting inroads. Sadly, this is a luxury that Singapore companies do not have, as the domestic market is simply not big enough to sustain overseas ventures or meaningful acquisitions. And the story of the future would be China. MNCs from China will dominate the world in time to come. As of now, 126 of the Fortune 500 companies are from the U.S. while China has 120 in the list. Soon China will overwhelm this list in a winners-take-all market. Compared to the U.S., China is less homogenous in terms of the demography. There is great wealth disparity between the cities in the coastal area and the inner regions. The saving grace is, the coastal area of China is home to 600 million homogeneous consumers. And thanks to Emperor Qin’s unification efforts more than 2,000 years ago, they speak one common language. That is double the United States’ population. With the Chinese Government building up domestic consumption in addition to being an export-oriented ‘factory of the world’, there is little doubt that Chinese companies will soon overwhelm the Fortune 500 list. The question of talent – is there any left for the private enterprises? Could technology companies, having an asset-light and disruptive nature, give Singapore companies an advantage to dominate the region? Grab, a rarely successful tech company headquartered in Singapore (the founder is a Malaysian and Grab first started in Malaysia), has established operations in many parts of Southeast Asia. They even ousted the once mighty but PR-disaster Uber out of the region. My belief is that we will have a few wildly successful cases but the majority of companies would be mediocre at best. A large domestic population does not just create a good customer base for businesses; it also provides a large labour force and most importantly, a pool from where to draw talent from. The late Lee Kuan Yew was the first to acknowledged that Singapore is limited by our talent. He would often cite the People’s Action Party’s difficulties in attracting enough talented people. He believed that our survival hinges on having the best minds in the government and the civil service so that they can make the right decisions in the best interest of the country. He saw that the best were inducted into the public sector via lucrative scholarships and accelerated career opportunities. If the civil service gets the best brains, we inevitably end up with lesser talents for the private enterprises. Our scholars would rather write policies to encourage more people to take entrepreneurial risks than to start a business themselves. How then, can our companies compete against more well endowed foreign companies? To be fair, our government has done her part in encouraging enterprise. In particular, they offer a lot of help in the form of grants to support our local enterprises. But we should be careful with grants because they could artificially support unsustainable businesses and render the overall business environment less competitive. It is a balancing act and we should also not attract people to pursue businesses for the wrong reasons, such as establishing a company to help other companies apply for grants. Lastly, I am of the opinion that Singapore has become a victim of her own success. Singaporeans have gotten so comfortable that we take a lot of things for granted. We have a lot of people blaming the government precisely because we have high expectations from a capable government. If our government were incompetent, we would just take things in our own hands and solve our problems instead of waiting for the authorities to solve them for us. The comfort extends to people becoming more risk adverse. American author Nassim Taleb was invited to speak at the National Library two years ago. He said something that has stuck in my head since then – we succeeded because we had no natural resources, it made us hungry and it made us fight for everything. He said that we cannot forget that and get too comfortable. Entrepreneurship in Singapore is uniquely top-down. We need our government to encourage us to start businesses. It has never worked that way. Entrepreneurship has to be bottom-up, the intrinsic motivation of the individuals to create dreams and things. We have probably lost that hunger. We have grown too comfortable to take risks. And hence I say we have many hindrances to build truly global companies. I might have sounded very pessimistic thus far. We are constrained by our geographical location. We are a small country in a diverse and dynamic geopolitical region. The government has first rights of refusal to our top talents. Singaporeans have gotten too comfortable to venture beyond their comfort zones. How then can the private sector survive and thrive? How can Singapore Inc be truly global when our best and biggest companies are not able to make their mark on the world stage? What does Singapore Inc really stand for? Let me end off on a positive note. Our economic planning has always been top-down. Jurong Town Corporation was started in 1968, soon after our country’s independence, to spur economic growth and to create jobs for Singaporeans. It was a success. We were a young country then, and a lot more structure was needed in the governing of the country. Lee Kuan Yew’s forceful personality commandeered many facet of the Singaporean’s life. We have moved on from that era but the central planning has continued unabated. The Government plans years ahead to develop the next economic driver for Singapore – Semiconductors, Jurong Island, Biological Sciences, Integrated Resorts and now Smart Nation. Our people have also been told what to focus on next. Schools churn out relevant curriculum to produce Singaporeans with the necessary knowledge to take on the jobs in these new industries. Our country operates like clockwork. We are well known for our efficiency. Let us make sense of this together. There are 198,000 SMEs in Singapore. Together, they hire 2,210,000 people while contributing only 35% of the GDP. 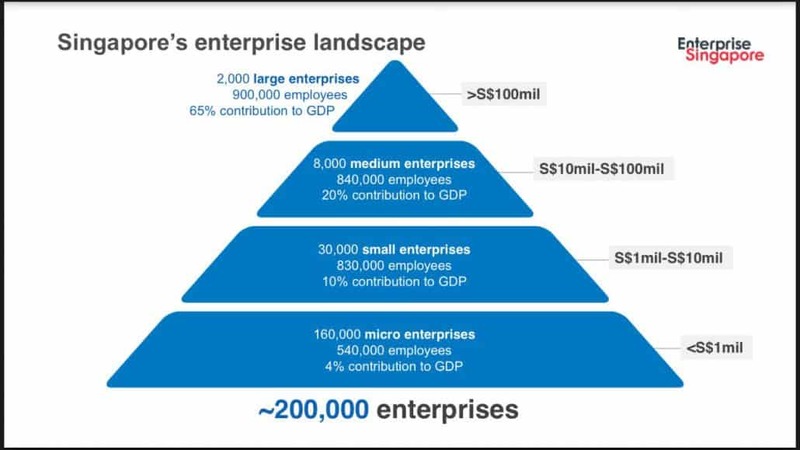 There are 2,000 large enterprises with a total headcount of 900,000. These larger companies are responsible for 65% of the GDP. In other words, large enterprises make crucial contributions to the GDP and tax dollars while the SMEs are pivotal in providing jobs to the majority. In 2017, the Inland Revenue Authority of Singapore (IRAS) reported that 29% of tax revenue is derived from the corporate sector. The next highest is Goods and Services Tax (GST) at 24%. Over a coffee conversation with Thomas from my15hourworkweek.com, he mentioned that the true form of Singapore Inc is that of a ‘payment gateway’. We need to have MNCs set up shop on our shores so that we can tax them. The above statistics showed that his words ring true. In order to attract foreign MNCs, we have to be a hub for everything. The Smart Nation initiative aims to attract the biggest tech companies to set up offices and regional headquarters here. They are future drivers of the global economy. They might also turn out to be the biggest contributors of our tax dollars. The Government, with its monopoly on talent, has figured things out ahead of us. We are not in a favourable position to create a world beating MNC. The odds of that happening are very low. The next best thing we can do is to attract foreign MNCs so that we can tax them. We have to be prudent with our expenses and invest our large foreign reserves to bolster our financial future. We need to operate as one Singapore Inc.
Singapore’s superpower is closely linked to our financial and economic status. We have no resources; we only have money. We cannot lose this power. The only way to preserve this and to ensure our survival is for our government to plan, execute and function as one Singapore Inc.
My message to investors is simple. Singapore is not a good place to look for growth stocks. Look elsewhere, in the U.S. or China. 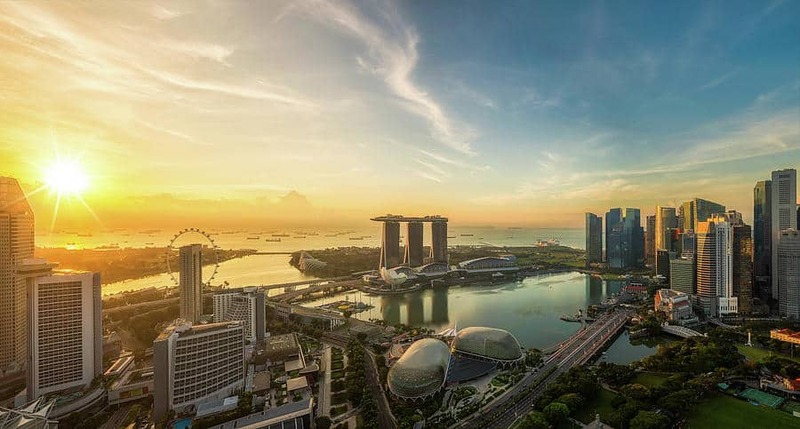 For entrepreneurs, it is easy to start a business in Singapore but the addressable market is going to be small and growth challenges would come rather quickly. If you just want to make good money as an SME, Singapore is the place to be. If you want to make a dent in the universe and seek global dominance, you may need to go elsewhere to make a name for yourself. Pick your battle ground wisely before you start. Lastly, to the rest of my fellow Singaporeans. There is a very good reason why our Government functions in this manner. Our Government must remain entrepreneurial. Our reserves are critical to our survival. We must continue to see that it grows. Happy 53rd birthday Singapore. May we remain peaceful and prosperous for many more years to come! Should You Start Investing Your Money if You’re in Debt? Many thanks for your very informative articles that are so contrarian to many stories that are heard from the mouth of the many that only spurt one sided opinion of our country. Being one of the many Singaporean entrepreneurs that are striving aboard, that is what we see as well. Economy of scale being one, Too comfortable being another, Top-down entrepreneurship being yet another. What is your opinion on dealing with such scenario and how do you think Singapore government should do to spur entrepreneurship and globalization of SMEs. Hi Dominic, thank you for your compliment. I read that you have two questions. One is what an entrepreneur should do when striving abroad, and second is how the government could help. It might not be a bad idea if you are doing business abroad as the market size potential would be larger than SG. Just have to know the audience better and cannot assume them to be similar to Singaporeans. I think it would be best to get a trustworthy local to be a partner, rather than going on your own. Government has been helping through Enterprise Singapore where there are assistance and grants available for SMEs to venture abroad. Can try talking to them and see what support they can render. 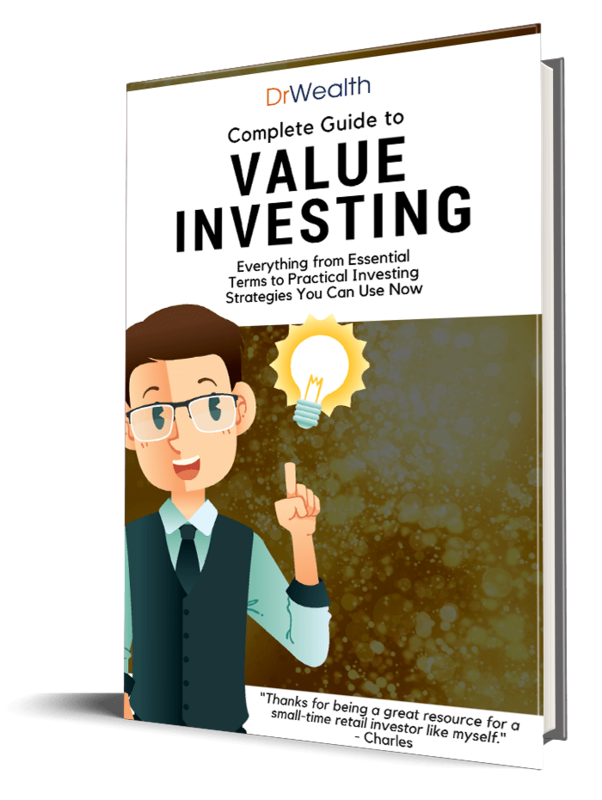 Many articles has been a story that ends up marketing investment courses and this is by far the best article written. Keep up the good articles. A great read. We have 1 unicorn in Singapore – Grab, which is founded in Malaysia. Hong Kong has at least 5 unicorns in fintech, crypto, and logistic space. Hk stock exchange is way way bigger than sg stock exchange. That’s all. Everything else in sg is better – their housing is in a mess, millennials are unhappy, massive waste management problem. One of the best articles I have even read on Singapore – history, governance, investing, comparison with world..all included in ONE. Good and insightful commentary to reflect on as we celebrate the nation’s 53rd – Majulah Singapura! Interestingly what I heard that the Venice topic was removed in the Social Studies curriculum this recent years. Many thanks for sharing your insight Alvin. I truely enjoy reading it and agreed largely to your view. However, I may like to bring up a country, which is similar to our size but have a more homogenous culture than us, to our thoughts. I do believe there is something for us to learn from them. Although their country don’t share similar measurement of Gross Happiness Index like Bhutan, but they do have the “happiest people” in the world! I would argue that Denmark had colonies and were dominating a much larger population than Singapore.